It was an absolute pleasure to watch the rehearsals for this year’s Winter Concert on Tuesday 12th December. Students from Years 7 –11 performed a variety of acts—from a breath-taking solo performance from Emma singing “7 years” to “Altogether now”, sung by Year 7. It was also wonderful to witness the improvement in the students’ performances— their increased confidence and ability was very apparent and to hear this obvious progression was magnificent. Well done, guys—be very proud of yourselves! “Yet again the music students took to the stage in what has become an annual showcase of talent here at Holsworthy Community College. 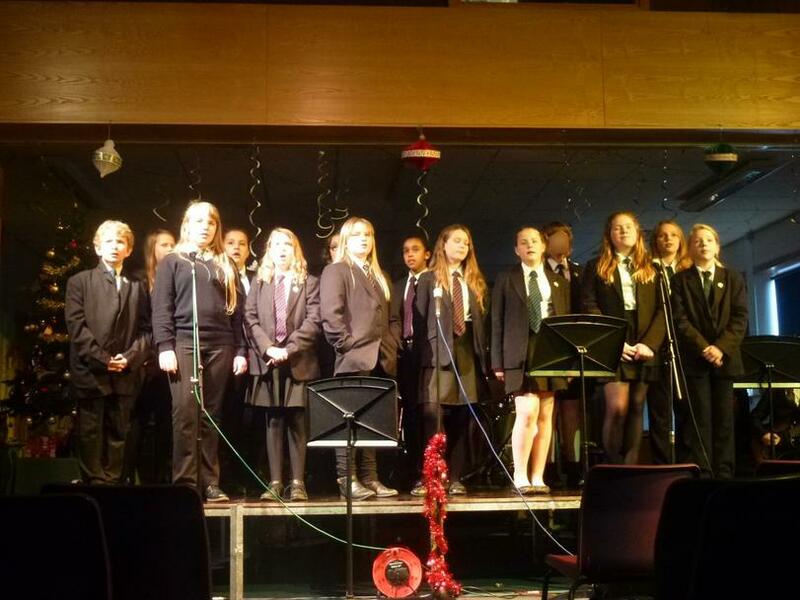 The students entertained the audience to a high standard with their performances and compositions with a repertoire ranging from old Christmas classics and carols to more modern music by ‘The Kings of Leon’ and Ed Sheeran. Lucy wowed everyone with her beautiful rendition of Ed Sheeran’s ‘Supermarket Flowers’, and Abby performed a piano arrangement of the hauntingly melodic, ‘Power of Love’. Eloise and Peter (the Music Department Prefects) took to the stage to perform at their final Winter Concert (being in Year 11) with a wonderful rendition of ‘Home’ and ‘Somewhere Only We know’. Not only do we have such a talented student body, but we have brave, confident and supportive students, and for some it was their first public performance at HCC: hopefully the first of many! Courtney gave a confident vocal performance of ‘Riptide’, supported by members of the GCSE class; Darcie’s emotional vocal style gave justice to ‘Jar of Hearts’, not to mention the Year 7 choir who were first up on stage. No pressure! I never cease to be amazed by the talent of students at HCC, so a BIG ‘Well done!’ to all for making every effort to contribute to a successful evening. It was for me, a true show of community spirit, with a wonderful atmosphere throughout. Parents and friends of HCC sang quite well too, under the watchful eye of Mr Scott!